The Grand National is a race that brings a nation to a standstill, with millions of people, racing fans or not, getting in the spirit and picking one or two horses to carry their cash. Over the years there have been some magical races, heart-warming stories and hard-luck, but all that matters is what happens when the final few go past the elbow. With that in mind, we are looking back at five of the best finishes in the Aintree spectacular. 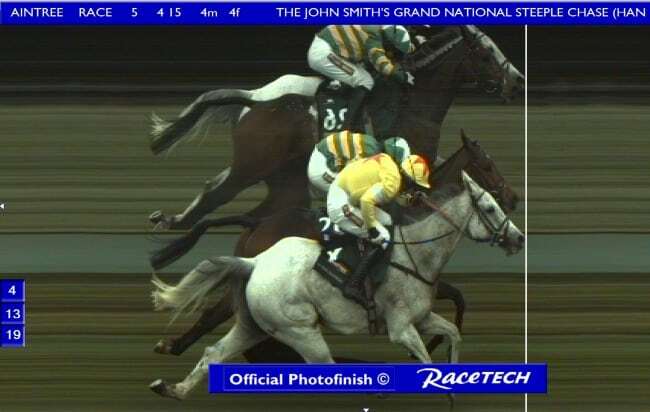 In the closest Grand National finish in history, it took a photo to decide that Paul Nicholls’ grey had snatched the race by a nose. Runner-up on Sunnyhillboy, Richie McClernon, was obviously devastated, but the untold joy on the face of victor Daryl Jacob told a bigger story. The victory marked a first success for the greys, and a poignant one for owner John Hales, who lost his superstar chaser One Man in a fall at the course 14 years previous. It might not have been a classic tight finish, but the 2001 Grand National was interesting in a different way. Run in unbelievably testing conditions, the finish was almost in slow motion, but more than that, only four finished. With jumping mistakes blighting the contest, just two horses jumped Bechers at the first time of asking on the second circuit, although Blowing Wind and Papillon were remounted and hunted round, with Smarty trailing behind the eventual winner in second. Not for the race itself, but the circumstances that surrounded the winner, this renewal will live long in the memory. 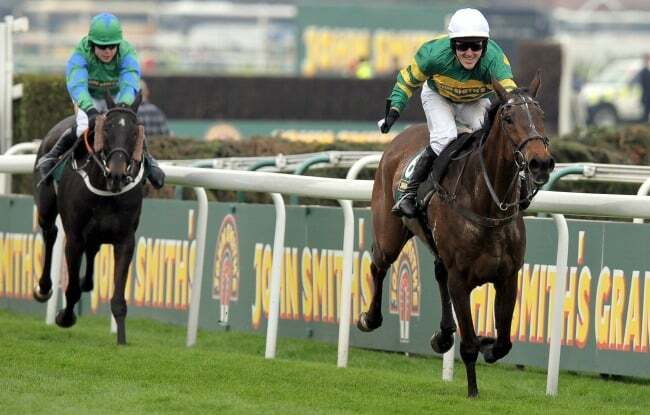 The greatest jump jockey around AP McCoy, had won it all – except the Grand National. That was until Don’t Push It saw off the challenges of Grand National stalwarts Black Apalachi and Big Fella Thanks to give the champ the most welcome of victories. Could he bow out in style with a second in five years on Saturday? While McCoy may be the most revered jockey of all time, as far as trainers go, Ginger McCain has got to be up there. Having taken three Nationals with Red Rum (we’ll come onto him in a minute), he couldn’t do it all again 30 years later, could he? Well, jumping the second last you’d certainly think not, with Amberleigh House a relatively distant fourth. But Graeme Lee rousted the old boy along to forge clear of the original leaders to give Ginger a reminder of what it feels like to triumph on Merseyside. Before he was the people’s horse, Red Rum was probably responsible for robbing Crisp of a magical, gutsy 1973 victory. Attempting to give the future star over a stone and a half, the Australian import blazed out in front, and literally put fences between himself and the chasing pack at times. But as they approached the elbow, the long-time leader was clearly weary. A smack from Richard Pitman sent him off line, and it was clear he was out on his feet, as Red Rum swept past to take victory by ¾ length and mark the beginnings of one of racings greatest legacies. Ladbrokes News’ equine expert, Ben likes nothing more than studying the form to pick out a winner or two for our readers. A Journalism and Media Studies graduate from the University of Winchester, Ben has previously written for a number of football and racing blogs and websites, as well as contributing to the sports pages of his home-town newspaper.